I came across fabric being used for formwork while doing some research on formwork materials. It is a totally new concept to me, but I was immediately struck by the brilliant application of this most modern of formwork developments. This page is made possible by the kind permission of Rick Fearn of FAB-FORM INDUSTRIES LTD. All the photographs on this page and information are from there. Thanks Rick. I am not connected to them in any way, but I am putting this here as I believe that in many cases in the past, I could have used these techniques myself, to good effect, especially in remote locations. 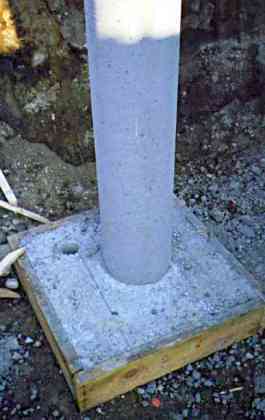 A method of forming footings - Fastfoot®. 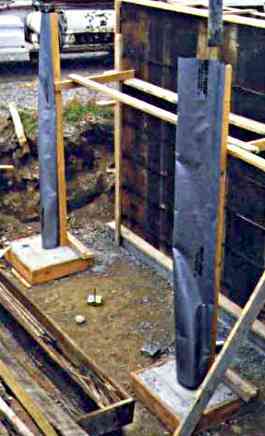 Fabric formwork - form for a pad footing. As you can see from the above photo, the amount of solid conventional formwork is is very little in this formwork method. The fabric comes in rolls of certain widths and it is simply cut on site to suit the size needed. Apart from normal tools for cutting and fixing the braces and perimeter frame, the only extra items are a Stanley knife and a staple gun. The fabric is cut neatly with the knife and staple to the timber. There is a very simple method of cutting the fabric at the corners, and when it is simply stapled in position that it, in effect, holds the corners together just as strongly as normal methods. 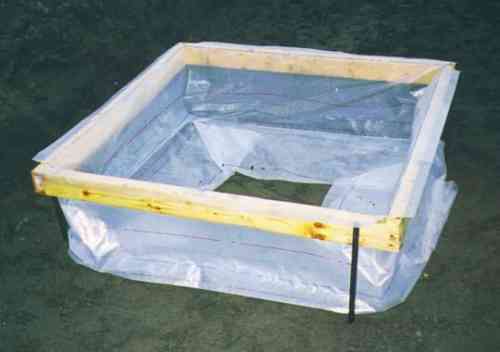 Before the pour, a sheet of standard plastic vapour barrier is laid on top of the fabric to stop the footing absorbing moisture if it is required. 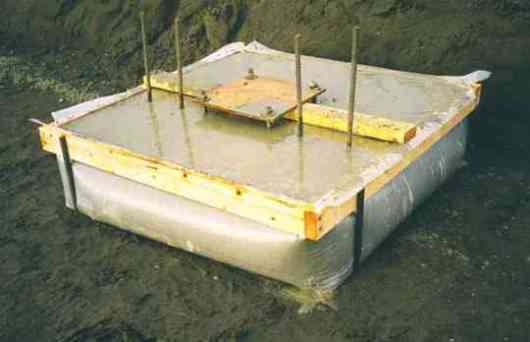 Fabric formwork - concrete in place. 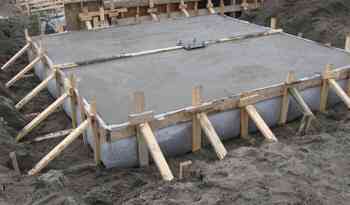 Here we see the pad that has just been poured. No movement at the top and a slight bulging at the bottom. I can remember on more than one occasion seeing the plastic vapour barrier that we use under our slabs, do a similar thing, obviously someone saw the same thing and was inspired to do something about it. 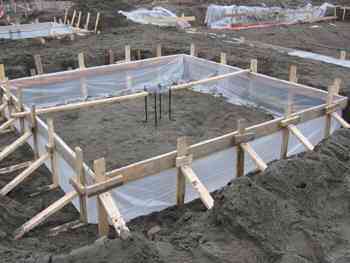 Fabric formwork - Larger foundation slab ready to pour. Here is a larger slab ready to go. I suspect that the layer of sand in the bottom is to hold the edges of the fabric down until the weight of the concrete takes over the job. Fabric formwork - Slab completed. Two empty tubes ready to pour Concrete being poured, about half full. The fabric come ready made up in tube sections to form the desired diameter of the column. The fabric tube is simply cut to length with a Stanley knife. In the manufacture, tabs are made vertically along a center line. The loose sleeve of fabric is fitted over the rebar. The tabs are then nailed to a straight length of 4" x 2" timber. The 4" x 2" timber is then positioned, and braced to hold it plumb. For the first foot or so a guy hold the base of the tube in the correction position with a boot on either side. Fabric formwork - Set up and ready to go. During the pour, it is possible for a guy to feel and guide the rebar cage, to make sure that it is in the correct position. Unlike conventional formwork, because this is a throw away, one off system there is never any reason for undue haste to strip the formwork. 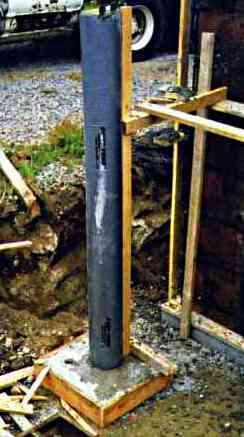 Just in case you had any doubts of the strength of this system, on the right is a photograph of a 20ft tall column ready to be poured in one hit. 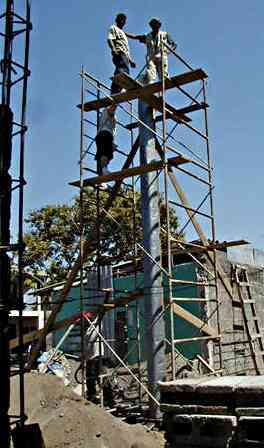 The project for a church in Nicaragua. << BACK: Formwork materials and systems.